It was a long six months, but it's finally been decided — Oscar Pistorius was found not guilty of premeditated murder by Judge Thokozile Masipa Thursday, but found guilty of culpable homicide Thursday. Basically, he managed to avoid the harshest of sentences — premeditated murder would have landed him in prison for 25 years to life — but he's still facing a potentially heavy sentence. But whether he lands in prison is utterly up to Judge Masipa, so here's a question: could Oscar Pistorius run again? And if he could, would he want to? The answer to the latter question is obviously speculative at this point — but the answer to the former was announced early Friday. 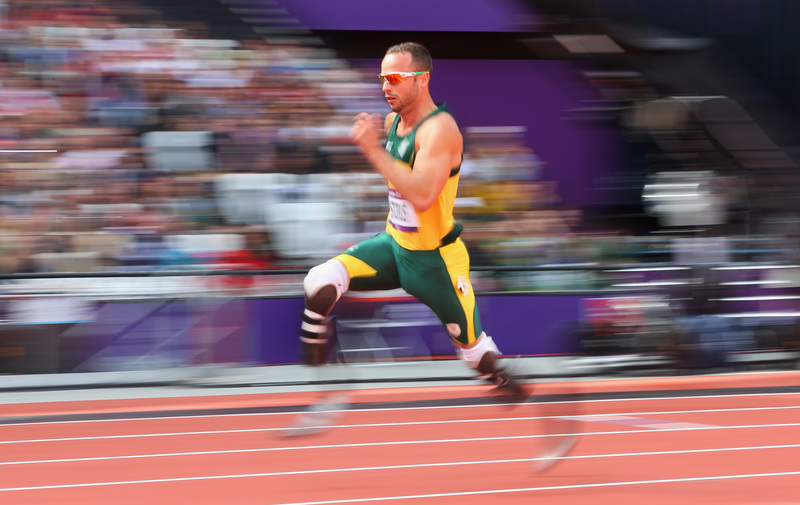 According to the International Paralympic Committee, whenever Pistorius is finished with the punishment he receives for killing Reeva Steenkamp, he'll be allowed to resume his sprinting career. This may sound surprising, given what a controversial figure Pistorius now is, as well as the fact that he's now a convict, but it's a complicated question for the IPC. In addition to all that, the ex-Olympian is one of the most famous and awareness-raising figures in all of para-athletics. As Yahoo Sports details, the IPC's director of media and communications, Craig Spence, told BBC Radio about the decision. Oscar's done a great deal for the Paralympic movement, he's been an inspiration to millions, but obviously his priority now is to see [what] the judge decides. Then if he wishes to resume his athletics career then we wouldn't step in his way, we would allow him to compete again in the future. Maybe the biggest question central to all this is how old Pistorius will be once he completes any punishment relating to Steenkamp's death. In simple terms, Masipa has the authority to impose the full 15-year sentence on Pistorius, in keeping with his conviction for culpable homicide. She could, however, suspend his sentence entirely, keeping him out of prison altogether. Such a decision would be pretty controversial, especially given the level of widespread outrage on social media at the news that he'd been found not guilty of murder, but public perception clearly doesn't dictate judicial decision-making. Pistorius was also convicted on a charge of firing a gun in a public place, which typically carries a five-year sentence, and would stack on top of whatever Masipa decides for his culpable homicide sentencing. So basically, there's a big likelihood that by the time he's free to resume his sprinting career, he'll already have aged out of the athletic prime. Even for a mere five-year sentence, if he went into prison tomorrow, Pistorius would be nearly 34 by the time he's released — near ancient for a top-flight sprinter. And if he gets another 15 on top of that — keeping in mind that he won't have access to the rigorous, specialized training regimens in jail that he does as a private citizen — he'd be a shell of his younger, dominant self. Masipa has set October 13 as the date for Pistorius' sentencing hearings, so the exact nature of his punishment will remain unclear for another full month.